On those days, the waves of physical symptoms hit me and emotions run rampant. I begin to feel this deep sense of depression sink into me, but it’s a place I don’t want to go again – I can’t go again. I do everything I can to turn it around, while trusting God to guide me. When emotions run rampant, I know I need to slow down and take some time to care for my body, mind, and soul. I need to think about the full picture, not just the tiny pixel I’m viewing in this moment. When I have a few bad days in a row with chronic illness (and I’ve spent far too much time in bed), I need to evaluate where I’m at and take steps forward. Even the tiniest shifts to my routine or day’s events can make a difference for my mental state. Over the past few months I’ve developed what I like to call a “mental health reset day.” At first this kind of day had no name, but it had a theme. I would stop striving in my attempts to heal from Lyme, Fibro, and CFS. Instead I would focus on embracing the moments of the day, taking it all in slowly and peacefully. I’d practice gratitude by praising God for who He is and for the ways He works. I’d dive into the Psalms and pray through the feelings I was experiencing by using God’s Word as a guide. On my chronic illness and mental health reset days, I like to do things I don’t usually do. I might go out for tea or treat myself to lunch at my favorite restaurant downtown. It’s not major pampering or anything extreme, but it’s special to me. I need that rest time to appreciate the small things in life. If you’re struggling after rough flare days with chronic illness, maybe it’s time for you to create your own mental health reset day. Here are some ideas to help you create a day that helps you feel a little bit better. Remind yourself of truth in the situation. Know that despite all the difficulties you’re experiencing, God is still good. He loves you and He’s working for your ultimate good, even if it may not feel like it at the time. If hearing other people affirm these things to you helps, try to get together with a friend or family member. Be honest about where you’re at and ask them to help remind you of truth! I can’t even begin to tell you how much getting out of the house can help boost your mood. Even if you’re only able to go out for a short period of time, see if you can get out! Maybe a friend or family member can take you if you’re not able to go alone. Try to get in the sun if it’s a sunny day; this is even better if you can put your bare feet in the grass! Sun is free Vitamin D and getting your feet in the grass can be soothing. Fresh air and sunshine are so good for us! The journal includes daily prompts to help those with chronic illnesses experience the comfort of God's presence in the midst of suffering. Let's embrace a spirit of gratitude and praise! Success! Your Guided Gratitude Journal is on its way! There’s something soothing about food, isn’t there? Eat something that you enjoy that also will be helpful for your health. If this means spending a little extra money on something super yummy and healthy, do it (as long as it’s financially viable for you)! I know that I always feel better after drinking Shakeology (email me if you want to know more about this). I don’t know about you, but I always feel better in a clean, fresh environment. While it might not be realistic to fully clean my house after a flare week. I mean, if we’re being honest, my house is usually a little bit of a disaster after multiple rough days of chronic illness. On a chronic illness and mental health reset day, I try to do a small amount of tidying. Even if it’s just doing some dishes or running a load of laundry, completing a household task or two helps boost my mood. Another important thing I do is diffuse my favorite essential oils: Joy Essential Oil, Peace and Calming Blend, and Ylang Ylang Essential Oil. These oils aid in mood support and help our house smell fresh. I often snuggle up with this super warm and cozy blanket and a heating pad after doing a little housework. Take some time to detox – especially if you’re dealing with Lyme Disease (but this is applicable with other chronic illnesses). I always feel a little better after drinking warm lemon water, taking some burbur-pinella, and having an epsom salt bath. See my post, Lyme Disease Detox Methods, for more detox ideas! 7. Do something you enjoy! Is there something you really like to do? Maybe it’s something artistic or musical. Or maybe you love watching movies. Do that! This one is highly personal depending on what you like. Make some time for something you enjoy on your chronic illness and mental health reset day! Here’s the deal: Even though creating a mental health reset day can make you feel better, it’s only a small piece of a greater awareness of your needs. You now have a toolkit of things to help you cope with chronic illness! Use this as a springboard to be aware of what you can do to help you feel even the slightest bit better on your journey. 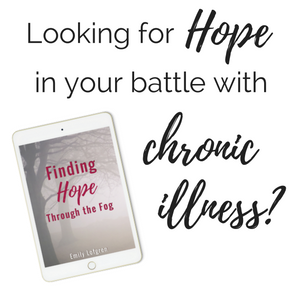 If you liked this post, I’d love to give you a free copy of my eBook, Finding Hope Through the Fog. In the eBook, I share about the ups and downs of my life with chronic illness and provide practical application for how you can turn to God in the midst of pain. Great tips. I know in advance that there is one day next week I’ll be physically and emotionally exhausted, drained, and in pain; but I’m working so much, I can’t afford to take an entire day. :( Hopefully I can still apply a couple of these. Thanks, Hailey! I’m sorry you’re not able to take more time to rest next week! I’ll pray that you’re able to feel a little refreshed! Sit under a tree…my current PT has a poster proclaiming all the benefits. And when I take the time, it makes me think how amazing God’s creation is, that we can get so much good, so much renewal, from being in nature for just 10 minutes. And, thank you, I really needed this today! Hey Kristen! Sitting under a tree sounds fabulous… Yes! being outside can be a huge blessing. So glad you found this helpful!